Here is the quilt lay out on a design wall. Looking good! I have been sewing the rows together and so happy about the result. It is for my brother’s 40th in October and it reminds me of him. I am heading out on holidays for three weeks as of Friday. I think it is going to be a bit crazy getting all four of us packed and ready for a lot of sewing and posting. Will be back at the end of April. Happy sewing! Last Saturday our family took the ferry over to Cockatoo Island to camp overnight with three other families. I cannot recommend this activity highly enough for families. 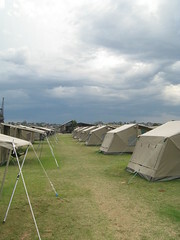 You can book a camping package that includes a tent, a lantern and two deck chairs. There are barbeques there as well as communal refrigerators and even a cafe. On top of it all there are even hot showers if you want to have one! I have to confess to not being a real “roughing it” kind of person and even I enjoyed this version of five star camping. I can’t say I slept a lot, but it was so much fun I would go again. We were even treated to an amazing electrical storm Saturday night which did not dampen any of our enthusiasm for the experience. Check out those ominous clouds in the photo! Alright, I still owe you a photo of the quilt’s progress and will try and post soon. 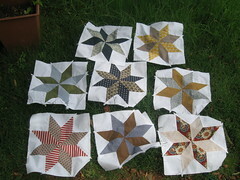 I have eight more stars to sew! Life is just getting crazier by the minute. The time to be creative has seem to have shrunk lately during the run to school, activities and building our house. Here is one of the photos of the stars I took about a week ago and was trying to find the time to upload. There has been even more progress since then and will hopefully upload a photo I took at class this week with the stars laid out. I am exhausted post camping overnight at Cockatoo Island last night with three other families. So much fun and have some great photos to share. It has taken me awhile to get into the new school routine. It has been quite a change from our laid back preschool days. To manage it all I have been getting up early to get us on the road and housework underway. I am not a morning person, but this has really helped balance managing piano practice, lunches to pack, washing, dishes, blah, blah, blah, etc. 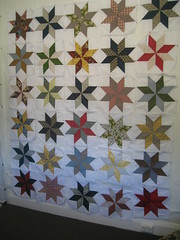 I am still working on the star quilt and loving every minute I am in class. The cutting and marking of all the pieces before sewing is the key to sharp points and accuracy. It is a lot of investment time to get the right result and worth all the planning. Here are some photos of another small cot quilt I am working on for Sloan in anticipation of winter. She really should be in a bed soon but until we move into our house she will be parked in her cot. A little snug, but warm for winter.